that doesn't appear in "The Part About the Critics"
“The Part About the Critics,” the first of the five parts that make up Roberto Bolaño’s sprawling 898-page work, 2666, may seem familiar to anyone who’s read his earlier novel, The Savage Detectives. Three men and a woman set out to track down an elusive, almost mythological writer, and their search, peripatetic and wayward, and ringed by suggestions of violence, eventually takes them into the Sonoran desert of northern Mexico. Only in 2666, this gang of four differs from that of the earlier book almost to the point of parody. All four are academics, for one thing, and their search is punctuated by literary conferences, papers, readings and re-readings, and translations – lots of translations, one assumes, since the four come from England (Liz Norton), France (Jean-Claude Pelletier), Spain (Manuel Espinoza) and Italy (Piero Morini) and their common link – the writer Benno von Archimboldi – is German. Their lives also entwine romantically and sexually, imbued with a near constant, adolescent anxiety about where they stand in relation to one another that occupies nearly as much of their attention as their quest for every shred of information about the mysterious Archimboldi. Benno von Archimboldi’s existence, like that of the poet Cesária Tinajero in The Savage Detectives, is entirely constructed by unreliable sightings and contradictory clues, most of which – not unlike Olive Oyl’s song in Robert Altman’s Popeye in which all she can think of to describe Bluto is that he’s “large” – tell us little about Archimboldi other than that he’s “tall.” The four critics “could read [Archimboldi]. They could study him, they could pick him apart, but they couldn’t laugh or be sad with him, partly because Archimboldi was always far away, partly because the deeper they went into his work, the more it devoured its explorers.” The writer is, in a word, missing; so, at least for the readers of 2666, is his writing. For all the attention the four critics lavish on Archimboldi’s work, the only glimpse Bolaño provides of it is some book titles. Omission is a frequent tool in Bolaño’s kit, but here the entire oeuvre of a writer, one in line for the Nobel Prize no less, stays just off stage, invisible to Bolaño’s readers (though the crumbs Bolaño throws us, these twenty-odd titles, allow 2666 to make a rather outsized contribution to the Invisible Library). This omission is not as great a loss as one might think, since Bolaño himself helps fill in the gaps by employing these four academics as vehicles for a delirious array of anecdotes, digressions, literary references, and miscellaneous sparks and tatters of text, writing that remains deeply compelling despite offering little that is cohesive or conclusive. Strung upon the plot line of the academics and their search for Archimboldi, Bolaño’s flights of writing signal one another across the text, sometimes coalescing into intimations, suggestions, pieces of a puzzle or puzzles that lead to no solution. Bolaño also begins, quite early in the novel (page 43 in my edition), to carefully drop into his story hints of horrors to come that accrue insidiously, creating an increasing atmosphere of dread. I wish to spoil nothing for those who haven’t read the book, but take it as assumed that those approaching it know that the center of gravity of 2666 is the series of horrific murders of hundreds of women perpetrated in and around Ciudad Juarez, Mexico beginning around 1993. Yet while these murders remain on the periphery of 2666 for most of this first part, violence does not. Two significant episodes of abject violence (among a host of other more minor episodes and allusions) feature prominently in “The Part About the Critics.” The first is directed at a Pakistani taxi driver in London who has had the audacity to make some disapproving comments about the propriety of Liz Norton’s behavior as a single woman out with two men, the generally mild-mannered Pelletier and Espinoza, who in response suddenly transform into enraged, out-of-control thugs, beating and kicking the cab driver and leaving him by the side of the road (and stealing his taxi too). The penalty they pay? Liz Norton suggests a brief hiatus in their seeing one another. The second prominent display of violence – and here we enter fully into Bolaño territory - appears as part of an artwork, one of several conceptual art pieces featured in 2666. Liz Norton recounts the story of a painter friend, Edwin Johns, who, before ending up in a sanitarium in Switzerland, had severed his own hand and placed it dangling within an assemblage/painting (“an ellipsis of self-portraits, a spiral of self-portraits”) displayed in a gallery. Unbeknownst to Norton, the three other academics visit Johns, who whispers to Morini a mysterious response to the question as to why Johns had cut off his own hand, a silent exchange (another omission) ostensibly linked to Morini’s temporary disappearance. The other critics cannot locate him, and their initial concern gives way to a kind of shrugged-off assumption that he’s okay and will turn up. Though we’re not privy to what Johns has told Morini or why it may have resulted in Morini’s dropping out of sight, Morini later suggests to Norton that Johns may have cut off his hand for money. But again, the suggestion is just that, providing no solid conclusion, like many elements in 2666 offering just another turn of the screw, another hint aimed at trying to gain some understanding of violence and barbarity, but left fluttering in the wind, awaiting, later in the novel, further echoes of it to appear. The generally calm and safe world of literary academia – one of conferences, papers, insular debates about intimate details of writers and their works – may seem far removed from the monstrousness in the world. But that distance is an illusion. As Bolano suggests in “The Part About the Critics,” violence is but a hair’s breadth away. It may erupt from within. Or, by a simple tug on a thread – in this case the rumored appearance of Benno von Archimboldi in the northern desert of Mexico – one can be drawn into the maelstrom. 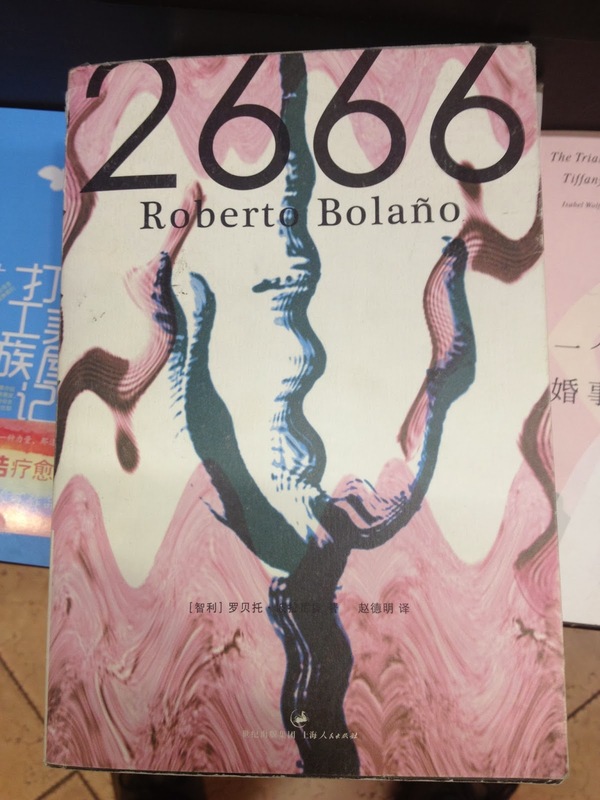 “The Part About the Critics,” which began with the academic’s innocent obsession with a mysterious writer, ends, by a curious trick of geometry, with Bolaño having physically moved us to the epicenter of barbaric atrocity, the murders of women that will be so central to 2666. This post is written as part of the 2666 group read hosted by Richard at Caravana de recuerdos. Appreciating your focus upon the flaws and humor in Bolano's depictions of the academics. I'm especially interested in that second act of violence that creates a work of art and your mention of it being one of several conceptual art pieces in 2666. Like an analysis of the dreams is very tempting so is the idea of diving deeper into each of these works of art. I believe that Miguel also mentioned something of this. Something else to attach myself to in this re-read. Frances - On this re-read, I'm noting the astonishing range of elements to which one might "attach" oneself for deeper exploration - dreams, references to art, references to literature and books, omissions, metaphors, instances of violence, reactions to violence, obsessions, commentary on academia, or on money and capitalism, or on globalism…I haven't even begun. It's a terribly rich book, isn't it? The instances of violence is rather overwhelming, and I haven't even come to the murders of the women yet. But, from the artist severing his hand, to the beaten taxi driver, to Rosa being practically assaulted in The Part about Fate, I see Bolano paving a theme of violence done from one person to another, from one person even to himself. How do overcome the violence, the hate, the way that we turn aside (sometimes) hoping it will all go away? I wonder if Bolano will provide any answers of his own. 2666 is helping me see the extent to which RB's earlier books (of those I've read) also zero in on a full spectrum of violence. I agree, he's "paving a theme" as you nicely put it. I'm doubtful that he'll provide answers, but assured that he'll make it more difficult for readers to accept facile ones. This last line of your reply to Bellezza--"he'll make it more difficult for readers to accept facile [answers]"--is one of the many things I most like about Bolaño's "method." He's a very interactive writer in that regard, much like his much admired Cortázar in Rayuela/Hopscotch. What a fine post, Scott! I particularly envy your (and Miguel's) ability to engage in such sustained analysis over the course of a relatively long post--I often struggle even writing my shorter ones. Anyway, I particularly appreciate your comments here about the critics' tendency to favor news about Archimboldi over wanting to learn more about the crimes. Also enjoyed your allusive prose regarding a "turn of the screw" and "by a curious trick of geometry." Entertaining and insightful as always, I see! Thanks, Richard. Well, you know, to paraphrase Pascal, I'm sorry the post is so long but I had no time to make it shorter. I liked using "turn of the screw" mostly because I think that - had he wanted to - Bolaño could have written some devastatingly suspenseful horror tales (not that 2666 isn't one! ); he's just so good at sowing seeds of dread, at ratcheting up the atmosphere. I suppose this is one reason Stephen King is an admirer. Scott, fine post. I think Bolaño is not very generous to the critics, they're all portrayed a bit in comical, absurd terms. I do think he's trying to make us lower our guards for the upcoming horrors, the calm before the storm. Thanks, Miguel. That's a very good point about Bolaño not being very generous to the critics; he paints them as having such adolescent qualities. I'm curious - and maybe you or Richard can help out here - what is "critics" in the original Spanish? Why doesn't he call them "academics"? Are the two terms conflated in Spanish? I keep thinking that "critics" doesn't seem quite right, in the same way that one of the four thinks at one point that the wold "afloat" isn't quite right. Critic is crítico; academic is académico. I suspect Bolaño used the former instead of the latter because not all critics are academics and because academic also connotes a member of an academy in at least some Spanish speaking countries. Interesting question. I am enjoying the joint commentaries on this book. When I think about it, I almost never read or am I usually interested in a book because the plot sounds interesting, yet the plot of this one seems intriguing. The way that violence just under the surface is one that seems to have been explored by many writers these days. For instance, I am thinking a little bit about some of Thomas Ligotti's short stories. The approach here sounds unique and creative. Brian - Plot and plots - Bolaño weaves so many stories and digressive plots into 2666 that one can't help but be intrigued.